And I love the idea of chocolate covered Oreos as an edible wedding favor! 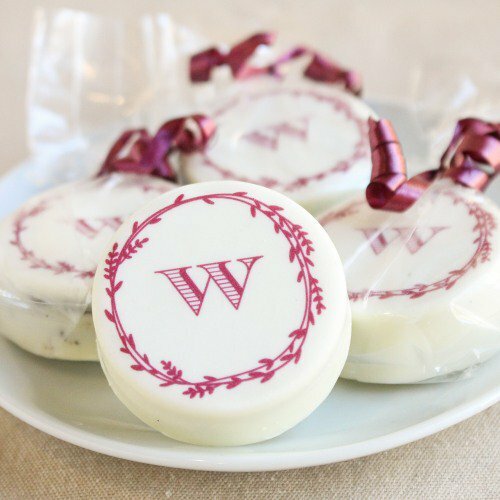 These sweet treats are available in white or milk chocolate and they make the sweetest parting gift for your guests. These would also be great for ‘welcome bag’ additions for your out-of-town guests. The cookies have a little bit of elegance too thanks to the three monogram designs available – these aren’t your standard run-of-the-mill Oreos! Each Oreo is individually wrapped in cello bags and tied with your color choice of ribbon. You’ll find this delicious favor here.